21. A person jumps from the roof of a house 4.5-m high. When he strikes the ground below, he bends his knees so that his torso decelerates over an approximate distance of 0.70 m. If the mass of his torso (excluding legs) is 45 kg, find (a) his velocity just before his feet strike the ground, and (b) the average force exerted on his torso by his legs during deceleration? Use v2 = u2 + 2as, |v| = 9.3915 m/s, v = -9.4 m/s. Use v2 = u2 + 2as, a = +63 m/s/s. 23. A box weighing 70 N rests on a table. A rope tied to the box runs vertically upward over a pulley and a weight is hung form the other end (Fig. 4-37). 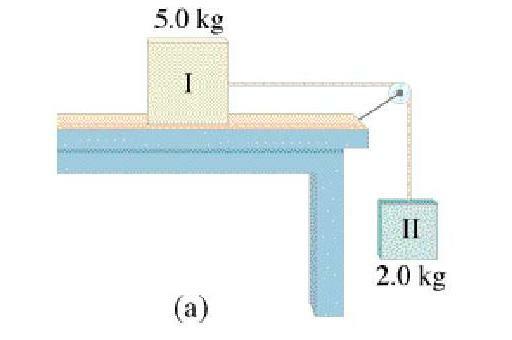 Determine the force that the table exerts on the box if the weight hanging on the other side of the pulley weighs (a) 30 N, (b) 60 N and (c) 90 N.
The weight on the other side of the pulley creates a tension in the rope, which exerts an upward force on the 70 N box. <90 N - 70 N + F> = 0 (since a = 0), so F = -20 N (downward) - Now it is most likely that the table will not, in the absence of glue or suction cups, exert a downward force, so in the case of c) the box on the table no longer rests on the table, but rather it is accelerating upwards so there would be Zero force exerted by the table. 27. The two forces F1 and F2 shown in Fig. 3-39a and b (looking down) act on a 27.0 kg object on a frictionless tabletop. If F1 = 10.2 N and F2 = 16.0 N find the net force on the object and its acceleration in each situation (a) and (b). In F = ma, the F is simply the vector sum of all outside force acting on an object. 29. At the instant a race began, a 65-kg sprinter was found to exert a force of 800 N on the starting block at a 22º angle with respect to the ground. (a) What was the horizontal acceleration of the sprinter? (b) If the force was exerted for 0.38 s, with what speed did the sprinter leave the starting block? 30. One 3.0-kg paint bucket is hanging be a massless cord form another 3.0-kg bucket, also hanging be a massless cord, as shown in Fig. 4-41. (a) If the buckets are at rest, what is the tension in each cord? (b) If the two buckets are pulled upward with an acceleration of 1.60 m/s² by the upper cord, calculate the tension in each cord. 31. A 6500-kg helicopter accelerates upward at 0.60 m/s² while lifting a 1200-kg car. (a) What is the lift force exerted by the air on the rotors? (b) What is the tension in the cable (ignore its mass) that connects the car to the helicopter? The total mass that is accelerating at .60 m/s/s is the helicopter mass (6500 kg) and the car's mass of 1200 kg or 7700 kg. I think the strategy they are giving is the correct one - although I would use energy for this since all we really care about is the final velocity of the lighter mass when the heavier hits the ground. So - first let's find the acceleration of the system. Second - let's set up the equations of Newton's second law for each mass. 39. A force of 40.0 N is required to start a 5.0-kg box moving across a horizontal concrete floor. (a) What is the coefficient of static friction between the box and the floor? (b) If the 40.0-N force continues, the box accelerates at 0.70 m/s². What is the coefficient of kinetic friction? Well, we know the maximum force of static friction is 40.0 N because it breaks free. 41. A 2.0-kg silverware drawer does not slide readily. The owner gradually pulls with more and more force. When the applied force reaches 8.0 N, the drawer suddenly opens, throwing all the utensils to the floor. Find the coefficient of static friction between the drawer and the cabinet. Well, we know the maximum force of static friction is 8.0 N because the drawer breaks free. 43. For the system of Fig. 4-30 how large a mass would body I have to have to prevent any motion from occurring? Assume µs = 0.30. 45. Two crates, of mass 75 kg and 110 kg, are in contact and at rest on a horizontal surface ( Fig. 4-47). A 730-N force is exerted on the 75-kg crate. If the coefficient of kinetic friction is 0.15, calculate (a) the acceleration of the system, and (b) the force that each crate exerts on the other. Now, this makes sense that it would be to the left, as we are talking about the 110 kg crate's force on the 75 kg crate. <F - 161.7 N> = (110 kg)(2.4759 m/s/s) = +434.0541 N = +430 N which also makes sense as the 75 kg crate would be pushing to the right. These are the equal but opposite forces that are referred to in Newton's third law. 47. A flatbed truck is carrying a heavy crate. The coefficient of static friction between the crate and the bed of the truck is 0.75. What is the maximum rate at which the driver can decelerate and still avoid having the crate slide against the cab? 51. A wet bar of soap (mass = 150 grams) slides without air friction down a ramp 2.0 m long inclines at 7.3°. How long does it take to reach the bottom? Neglect friction. How would this change if the soap's mass were 250 grams? Since there is no friction, the normal force is not relevant. Which is exactly what the acceleration was in part a), so the time to go down the plane will be the same. 62. Suppose the coefficient of kinetic friction between m1 and the plane shown in Fig. 4-53 is mk = 0.15, and that m1 = m2 = 2.7 kg. As m2 moves down, determine the magnitude and direction of the acceleration of m1 and m2 given q = 25o. I suppose the possibilities are that the system accelerates with m2 going faster and faster (accelerates down), or that it slows (accelerates up) or maybe (not likely) they have picked numbers that make the acceleration zero. We are going to have to set up two equations (assuming the mass of the pulley is negligible), one for each block. Let's pick the positive direction for acceleration to be with m2 moving down, and m1 moving up the plane. For m2 we have the tension up (-), and the weight down (-). 67. (a) If the horizontal acceleration produced by an earthquake is a, and if an object is going to "hold its place" on the ground, show that the coefficient of static friction with the ground must be at least µs = a / g. (b) The famous Loma Prieta earthquake that stopped the 1989 World Series produced ground accelerations of up to 4.0 m/s² in the San Francisco Bay Area. Would a chair have started to slide on a linoleum floor if the coefficient of the static friction were 0.25? 69. Police lieutenants, examining the scene of an accident involving two cars, measure the skid marks of one of the cars, which nearly came to a stop before colliding, to be 80 m long. The coefficient of kinetic friction between rubber and the pavement is about 0.80. Estimate the initial speed of that car assuming a level road. 73. Two boxes, m1 = 1.0 kg with a coefficient of kinetic friction of 0.10, and m2 = 2.0 kg with a coefficient of 0.20, are placed on a plane inclined at 30°. (a) What acceleration does each block experience? (b) If a taunt string is connected to the blocks (Fig. 4-54), with m2 initially farther down the slope what is the acceleration of each block? (c) If the initial configuration is reversed with m1 starting lower with a taut string, what is the acceleration of each block? By now we know that the box with the smaller coefficient of friction will accelerate down the plane faster than the one with the higher coefficient, as the acceleration is independent of the mass. This means that there will no tension in the string, as the 1.0 kg block will be accelerating faster down the plane than the 2.0 kg block. If the 1.0 kg block that wants to accelerate at -4.2 m/s/s down the plane is tied to and places below the 2 kg that wants to accelerate at -3.2 m/s/s, there will indeed be tension in the string, and the two blocks will move together with the same acceleration, so I will treat them as one object. d) So what is the tension in the string?? I know it is .566 N Can you show that it is??? Can you??? 74. A 75.0 kg person stands on a scale in an elevator. What does the scale read (in kg) when (a) the elevator is at rest, (b) the elevator is climbing at a constant speed of 3.0 m/s, (c) the elevator is falling at 3.0 m/s, (d) the elevator is accelerating upward at 3.0 m/s/s, (e) the elevator is accelerating downward at 3.0 m/s/s? Which the scale "converts" to kg by dividing by 9.80 N/kg, and gets 75.0 kg again. 81. A 28.0 kg block is connected to an empty 1.00 kg bucket by a cord running over a frictionless pulley (See below). The coefficient of static friction between the table and the block is 0.450, and the coefficient of kinetic friction between the table and the block is 0.320. Sand is gradually added to the bucket until the system just begins to move. (a) Calculate the mass of sand added to the bucket. (b) Calculate the acceleration of the system. When the block is about to slide, the weight of the bucket and the sand is just equal to the maximum static friction that exists between the block and the table. 123.48 N = m(9.80 N/kg), m = 12.6 kg total, which is 11.6 kg of sand added to a 1.0 kg bucket.